Great list, couple with children and a friend called Miguel who is celebrating a birthday. Em and Neil Dinner, sushi stuff, milk, pizza and bits for boys, washing up liquid, cereals, nuts, Miguel birthday present, popcorn, eggs, bacon, night cream. 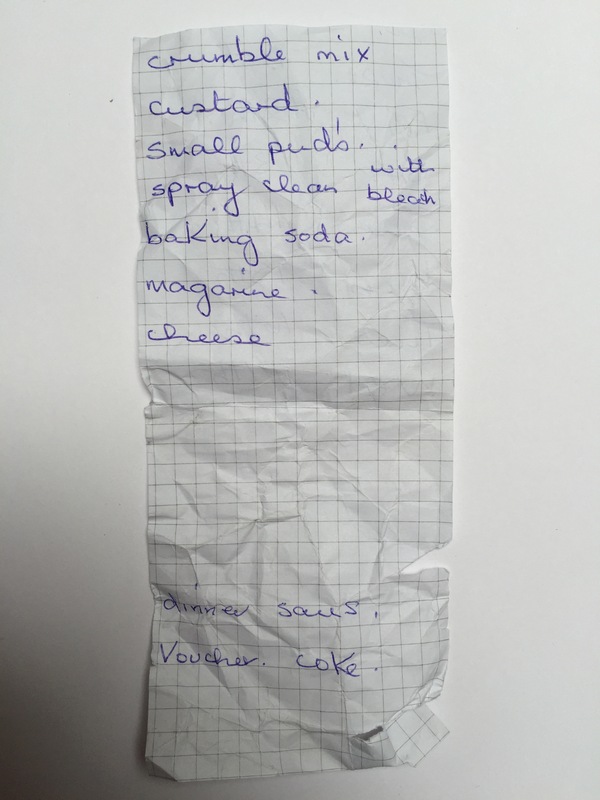 Squared paper, a blue biro, dots after each word. Are those apostrophes to be seen in the plurals; eggs, rashers and chillis? 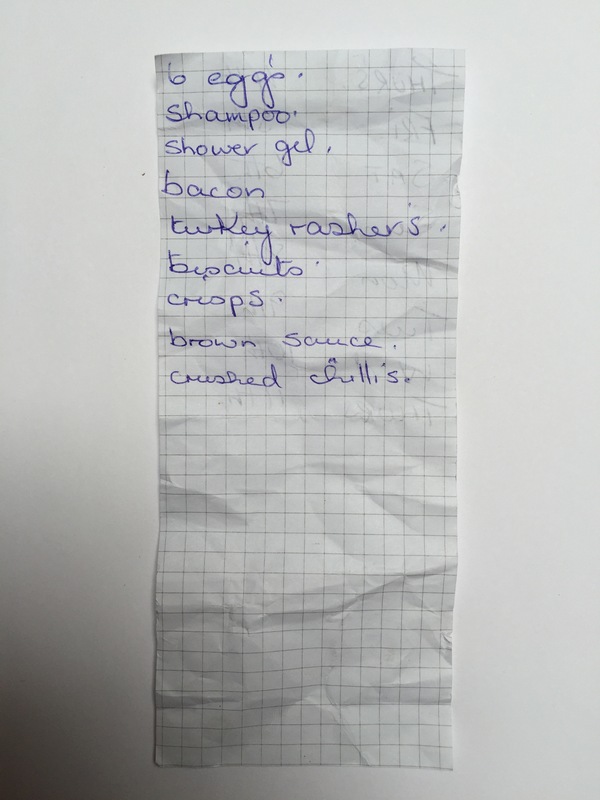 The shopping list: 6 Eggs, shampoo, shower gel, bacon, turkey rashers, biscuits, crisps, brown sauce, crushed chillies. 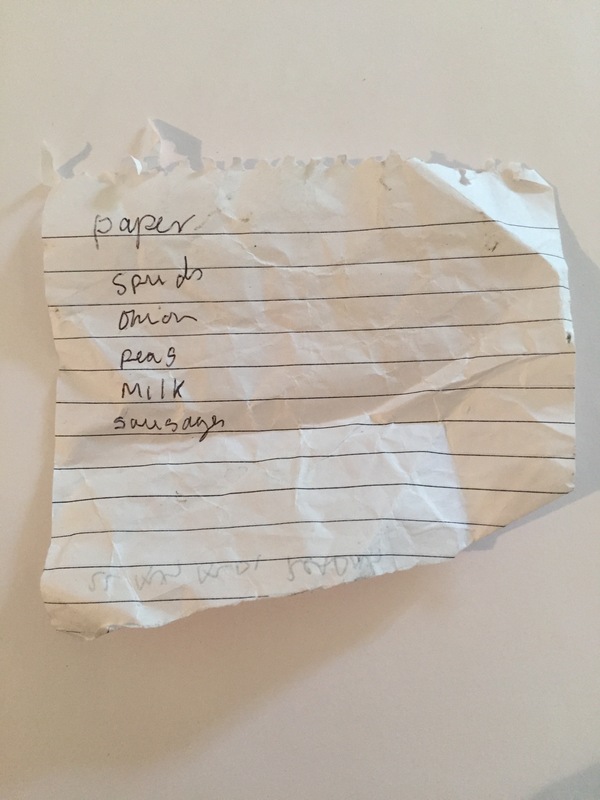 Paper, spuds, onion, peas, milk, sausages. The meal – Sausage, mash and peas with onion gravy. Read the paper afterwards with a cup of tea with milk. Sliced cheese, crackers, tortilla chips, cocktail sausages, olives, yoghurts, eggs, alcohol, orange and apple juice, halloumi cheese. 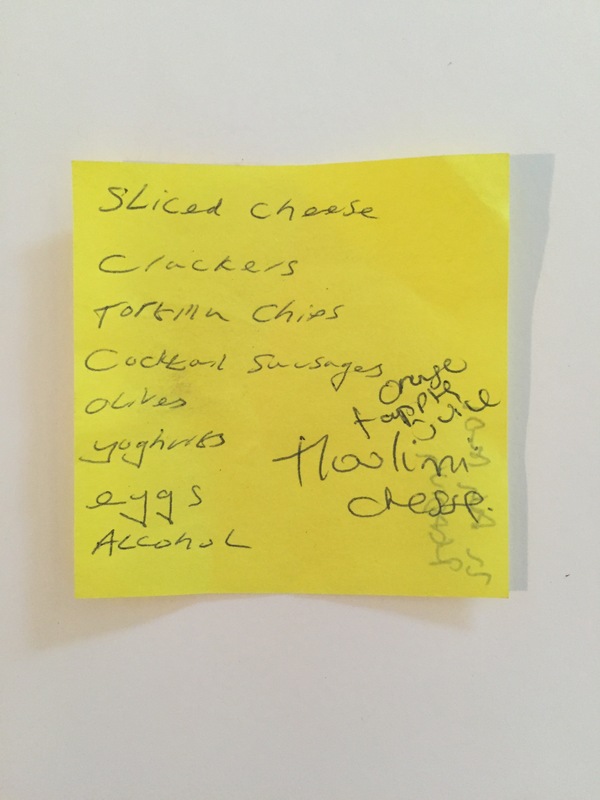 Could this person be buying for a small drinks reception with the alcohol, olives, juices, crisps and cocktail sausages? Eggs, hob work?? 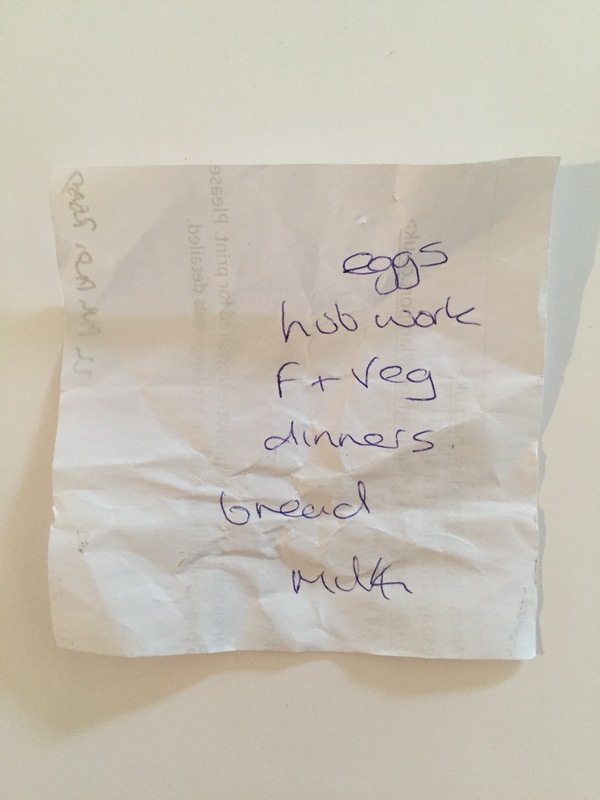 ?, fruit and veg, dinners, bread, milk. 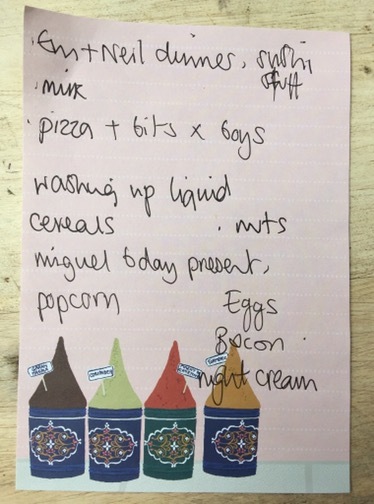 A standard small shopping list, bread, milk, eggs etc. The ‘dinners’ imply that they will not be made from scratch. Crumble mix, custard, small puds, spray clean with bleach, baking soda, margarine, cheese, sausages, coke. Somebody who bakes their own cakes. Has a sweet tooth. Having sausages for dinner. This is not a big weekly shop, rather a top up for required items. 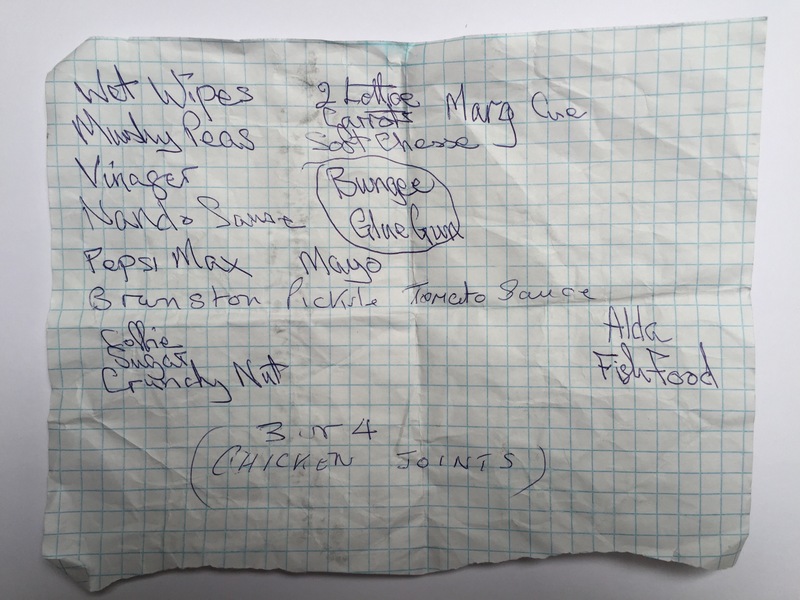 Wet wipes, mushy peas, vinegar, Nando’s sauce, Pepsi Max, Branston Pickle, Coffee, sugar, crunchy nut cornflakes, lettuce, carrots, margarine, cucumber, soft cheese, bungee glue gum, mayonnaise, tomato sauce, alda, fish food, 3 or 4 chicken joints. There are a number of items of interest here. What is bungee glue gum? Alda? This person likes their condiments, keep fish, will be having salad at some point and has crunchy nut cornflakes for breakfast.